derrickdj1 had the most liked content! Sorry to hear of the lost to your family. May she RIP. Prayers sent. Early this morning it was -23 but, we have warmed up to -18. I will go out to lunch today just to get a taste of frosty, lol. I would not disable MCACC or set the speakers to large. Did you jack-up the bass? Are you in an apartment? You can always listen in the stereo mode late night. Which Pioneer avr do you have? For this question, zero sum gain. In other words, no one correct answer. I have the Marty cube. It is a great sub and can keep up with my larger subs with closer placement. I would not hesitate to buy one or two of the Marty Cube or any of the other Marty subs. The guy behind GSG Audio designed my Deep Invader and BackBum Buster subs. He is well known in the DIY AVS forum community and is highly respected for his designs and subs. His subs can stand up to JTR, PSA, SVS, etc. It really all comes down to the driver used and size. One of his subs is very cheap in comparison to the other manufactures. The true measure is price / performance. The finish is up to you! What's his membership fee, ah ha! Ir sounds like a problem with setup or the room. If you are also going to use them for HT, setup the sub and see what you think. Keep asking question and other will help you get things right. I have two of the Marty, 2 Mini Marty and Marty cube. These are excellent subs and not just for HT. They are large subs and tuned low. I had some of these at the same time I had sealed subs and have all vented subs now. I heard no difference using the vented vs sealed due to the low tuning with music. Don't just plan on fixing the pop or surge. A 30 year old piece of gear needs a big financial investment. Just figure out is it worth it. 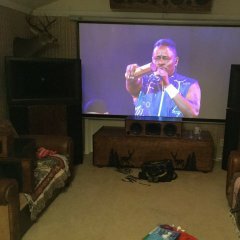 Klipsch Home Cinema at last!!! No need to keep all the driver sizes the same. Get the biggest Atmos speaker that will fit in the ceiling. There is no real reason to keep all the drivers the same size. They all have different jobs and no reason to make the same tool work all these different jobs. I have 4 1/2 to 10 in. drivers in my system. The 4 1/2 in. stand out as much as the 10, 8 or 6 in. drivers. OSU can leap frog Ok. They have given up fewer points per game and look like a national championship contender. It they do the same next week, it will come down to the wire with the committee. When Cordell Jones lead the Bucks to their last national title, many people thought they were not ready and clear underdogs. Urban should retire. There are more important things than football. He will also leave knowing he gave Michigan the biggest #$$ whipping in Big Ten History.